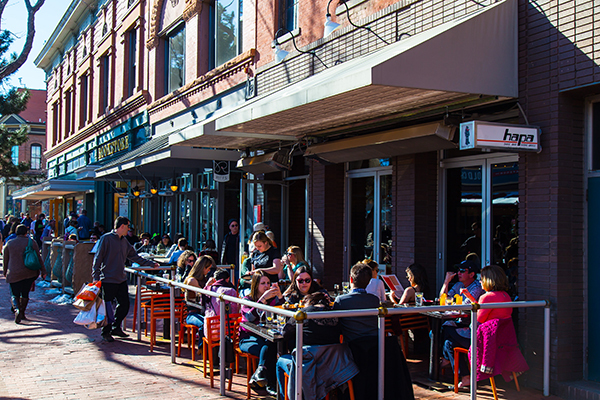 One thing downtown Boulder is definitely known for is its eclectic dining scene. I feel so lucky to live in a place where restaurants offer fresh food from local farms, a variety of cuisine types, talented chefs and innovative restaurateurs who make dining downtown an exciting, special and memorable experience. I wanted to highlight my favorite places ranging from cozy breakfast spots, classic American pubs to elegant fine dining experiences and everything in between! For breakfast my favorite spot to go to is Snooze. It’s cheery interior, free drip coffee and friendly staff always make the wait worthwhile, as does the incredible breakfast food served at Snooze. You seriously cannot go wrong with the decadent menu. My go tos are either the Chili Verde Benedict or the Bella Bella Benny when I stop in. They offer an extensive coffee menu as well as bubbles and booze to enjoy while you brunch! For lunch I often head to Next Door with their mix of both healthy and classic American cuisine options you seriously can’t go wrong. I recommend the incredible garlic parmesan smashers to start followed by either one of their delicious burgers or the wild caught Alaskan salmon bowl if you are feeling a little healthier. Rumor has it the kale chips are to die for as well! Another one of my favorite spots for lunch is Mountain Sun Pub & Brewery. At Mountain Sun they offer an array of craft beers brewed in house along with fantastic pub fare. I recommend trying their Basil and Bleu Cheese Burger or a heaping plate of their nachos to start. My favorite happy hour spot currently is T/ACO. Located on Walnut Street T/ACO is the perfect place to go on a college budget. Everything at T/ACO is made with fresh ingredients in house including tortillas, chips, salsa and guacamole! You don’t want to miss out on Taco Tuesday at T/ACO either. On Tuesdays house margs are $4 and street tacos are $2 all day! For dinner I like to go to one of my downtown Boulder staples, Salt. The restaurant offers brunch, lunch, dinner and a great happy hour too. They capitalize on fresh ingredients and sourcing seasonal produce and fruit along with natural meats. I love getting one of their cheese and Charcuterie boards to start the meal. You can’t go wrong with Mary’s Chicken or the organic power bowl. Salt provides a beautiful atmosphere to meet with friends and family and share time together over delicious, good-for-the-soul-food. If you’re in the mood for seafood head next door to Wild Standard. Salt’s sister restaurant. Enjoy beautiful small plates and elegant dishes featuring exotic flavors! Another one of my favorite dinner spots downtown is Via Perla. Via Perla embodies authentic Italian cuisine. Start with the caprese or the burrata and prosciutto. Follow these amazing apps with the Trofie Al Pesto, a basil pesto pasta, the Cacio e Pepe or the Gnocchi Al Pomodoro, a dish served with soft pillowy gnocchi and tomatoes. Along with dinner at Via Perla you can’t go wrong with their happy hour from 3-6:30 pm everyday of the week, enjoy small plates along with an extensive list of drinks! And last but not least we can’t forget about dessert I like to stop into Fior Gelato on the West End for a sweet treat! They offer gelato made fresh daily along with handmade Belgian waffles and espresso drinks. These are just a few of my favorite spots to eat downtown! There are so many other amazing restaurants that I can’t wait to try like Arcana and Frasca to name a few. For a complete listing of downtown Boulder dining options visit https://www.boulderdowntown.com/dining.